Digital models of the topography of a specific land is highly essential to aide a list of urban development and geological requirements. Since it's a highly important part of Point Land Surveying applications, it becomes even more crucial to create important 3D terrain models that can be used for land-use studies, creation of wide range of geological applications, improved transportation system planning, etc. Outsource2india creates clear, detailed, and simulated digital terrain images to help our growing list of clients to get enhanced models of the required topography. As part of our highly systematic Geographic Information Systems (GIS) related services, 3D terrain modeling services at Outsource2india are produced by experienced drafters and modelers with ample industry experience. With our ability to provide elevation data which directly impacts in creation of realistic and exact views of the maps, we meet your needs with precision. Global delivery processes, assured quality standards, skilled resources, and two decades of engineering service provisioning experience, Outsource2india is a preferred partner for all GIS related services including, digital terrain modeling services, geological mapping, photogrammetric services, location-based services, and land management. Outsource2india leads the way with its advanced terrain modeling systems based on the principles of digital terrain models. We provide advanced terrain mapping services that are useful for modern day infrastructure planners and land developers. O2I has a made a name for itself in every project that involves the construction of sewage lines, water channels, drainage, and other community level service. We offer extensive reports on current projections and give an accurate mapping layout. We have our own team that conducts ground surveys that form the basis of the photometric surveys at the higher end. We create accurate Terrain Models to support 3D analysis of your projects. Our expert team creates beautiful and life-like 3D sceneries and models. Using LiDAR, autocorrected surfaces, and photogrammetric techniques we design a three-dimensional framework on which a realistic "skin" is applied. We offer smartly designed services to produce Terrain Models made of plaster, foam, and thermoplastic. 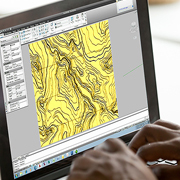 In addition to the ground channels, we also help create highly detailed Digital Terrain Models for the generation of contour. Highs and low of the terrain can be planned and surveyed using O2I's sports arena program. Municipal organizations and city-planning tenders vouch for us when it comes to building a city from the grounds. O2I offers full color terrain model drafting. Cutting through mountains and creating all-season roads is a challenge. We offer an accurate meshing of the surrounding landscapes and help in creating a breath-taking route through the mountains. We help create terrain models of air-strips and helipads on mountain tops and plains. Why Choose Us for Terrain Modeling Services? Outsource2india's team of BIM experts thoroughly analyzed five different angles and portions of the floor-wise laser scans provided by the client and converted into a single REVIT model and submitted the completed model through Dropbox. Outsource2india has been a pioneer in providing high-quality terrain modeling and a series of other civil engineering services. As your terrain modeling services partner, we assure highest quality terrain models, that are delivered to you on time for your critical infrastructure of land development projects. The list of satisfied clients and the industries we cater to grows with every successful project completion. Contact us today to get the best of terrain modeling and digital terrain modeling services at competitive rates.